With a degree in physics from Imperial College London, 1974 found May working on his thesis ( the study of reflected light from interplanetary dust and the velocity of dust in our solar system ). Academic pursuits ended with the rise of Queen’s star. Over 40 years and honorary degrees from Hertfordshire, Exeter and Liverpool John Moore universities later, May buckled down. 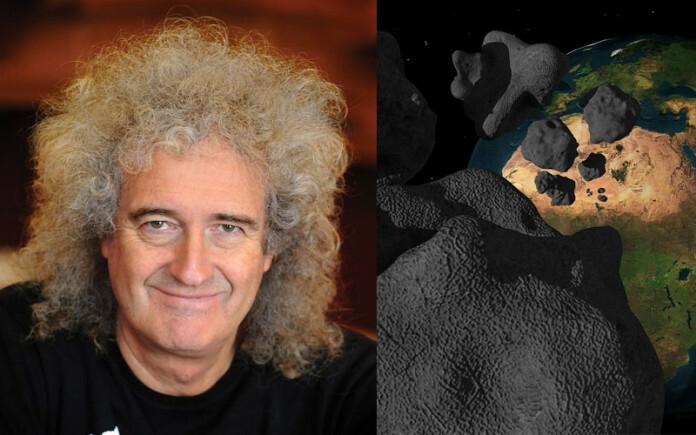 Submitting an updated thesis “Motions of Interplanetary Dust” to Imperial College – Brian May earned his PHD in 2007. A key aim of Asteroid Day is to lobby for a 100-fold increase in the detection rate of Near Earth Objects. “This is a catastrophe that could be averted,” he said. This entry was posted in Music, Space and tagged Asteroid Day, Brian May, Dr. Brian May, music, Queen, space, Tunguska Siberia Meteor. Bookmark the permalink. I know he has a PhD, but something about Brian May makes me want to slap him. To add to the heresy, I was never a big fan of Queen either, though I did have their first album back in 1974. Honestly, I never gave May much thought until discovering his PHD in astrophysics. Being a space nut, it tickled my fancy. As for Queen – Pacific Colosseum Vancouver 1976, Night At The Opera tour, front row, Freddie Mercury in my face – curled my toes! Just because you play an instrument doesn’t make you an idiot? Well I’ll be doggone…. Why is it that it’s so hard to see people as being multi-dimensional? It’s so much easier to see them as a “something” — and not as rounded out people. The whole thing about adopting ‘expectations’ about people only to find out later that they never were you you pigeon-holed them to be. Luv it! I knew of his academic background years ago, but was also surprised when I found out. A very intelligent bloke. I saw Queen at the Sun City Superbowl in Bophuthatswana (South Africa) . Was a superb concert, especially when May stepped into the spotlight and played Brighton Rock. Blew me away.